Russian President Vladimir Putin held a press conference on the sidelines of the eighth BRICS summit in Goa on Sunday, October 16. 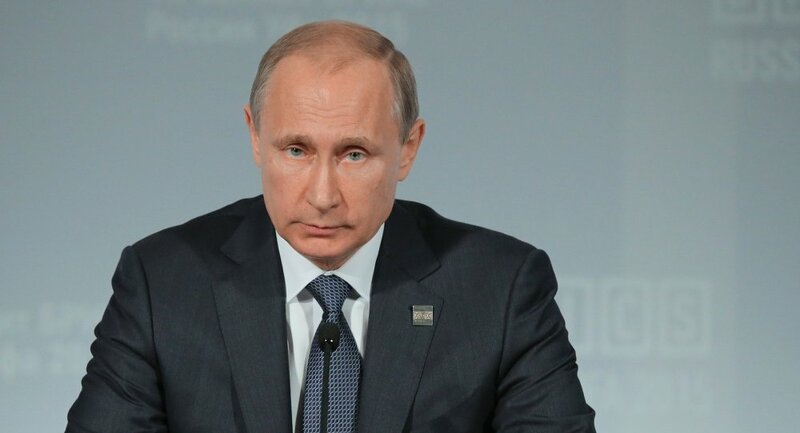 Russia is not going to influence presidential elections in the US, Vladimir Putin said during the press conference. "I’d like everyone to calm down — we are not planning to influence the course of the elections in the US," the president said. When asked about the presidential candidates, Putin said that Hillary Clinton has chosen to take an aggressive stance with accompanying rhetoric in regard to Russia, whereas Donald Trump is calling for cooperation in counter-terrorism. "We do not know what our relations will be like after the elections," President Putin said. "We don’t know if Donald Trump will carry out his intentions, how far he will go in cooperating with us. Or if Hillary Clinton will put into practice her threats and harsh rhetoric toward Russia. Perhaps, she will soften her stance. But naturally we welcome anyone who is willing to work with us," he said. Russian President Vladimir Putin expressed hope on Sunday that the Moscow-Washington relations would get an opportunity to be restored after the presidential elections in the United States. "I hope that when these elections, debates, this difficult period in the internal political situation in the United States finishes, there will be chances to restore the Russia-US election," Putin said at a press conference in India's Goa. According to Putin, Russia is not seeking to be at confrontation with the United States. "If someone seeks confrontation, it is not our choice. But it means that there will be some problems. We do not want this, on the contrary, we would like to look for common ground and jointly respond to global challenges, which Russia, the United States and the whole world are facing," Putin added. Putin noted that Russia had no intention to somehow influence the election campaign in the United States. "Of course, we welcome all those who want to work together and consider erroneous the thesis that we need to constantly argue with someone and, thus, pose a threat to themselves and to the world," the Russian president stressed. It is the first time when the United States has threatened on such a high level cyberattacks against other countries and admitted spying on its enemies and allies, Russian President Vladimir Putin said. On October 15, US Vice President Joe Biden said that the United Stated intended to respond to hacking attacks allegedly conducted by Russia. "There is evidence and confessions [about cyberattacks]. [The United States] is spying not only on their potential adversaries, at least those whom they consider as such, but also on their allies, including the closest ones… So what's new here? Nothing. The only new thing is that for the first time on such a high level the United States confesses: first — that it is engaged in it, and second — it threatens [to respond], to a certain extent, which is not in line with the norms of the international communication," Putin told journalists when commenting on Biden’s remarks on possible cyberattacks against Russia. The Russian president added that one "can expect anything from our American friends" who were spending billions on spying.